Kerry Potts is a self-declared Aboriginal-arts activist and proud Teme-Augama-Anishnaabe woman of mixed heritage who’s worked in urban Aboriginal communities in Ottawa, Toronto and Chiang Mai, Thailand. On the evening of Thursday, January 26, a line 200-deep formed around the Art Museum at the University of Toronto. All were there to witness the opening of Kent Monkman’s exhibition Shame and Prejudice: A Story of Resilience, his “Canada 150” project for the Art Museum. I echo the words of several witnesses to this event by saying that this may be the most significant art exhibit I have seen in my lifetime. Spanning 300 years of colonialism, and encompassing a range of time periods and themes, from Chapter IX: Urban Rez and back to Chapter I: New France, Reign of the Beaver, this is a love letter in nine chapters to the resilience of Indigenous people. The exhibit begins with the birth of our trickster/narrator, Miss Chief Eagle Testickle, who leads us back in time through her amended history of this land. The moment I enter the exhibit, Archer Pechawis—performance and media artist, and captivating person in every sense—offers a hug, but is soon pulled into the churning crowd. To the right of me, Archer appears once again, this time in acrylic on canvas. In this room, Chapter VIII: Sickness and Healing, Miss Chief recalls the epidemics and loss we experienced, and reminds us of our spiritual strength. In The Death of The Virgin (After Caravaggio), the artist’s rendition of Archer offers a smudge beside the deathbed of his child. 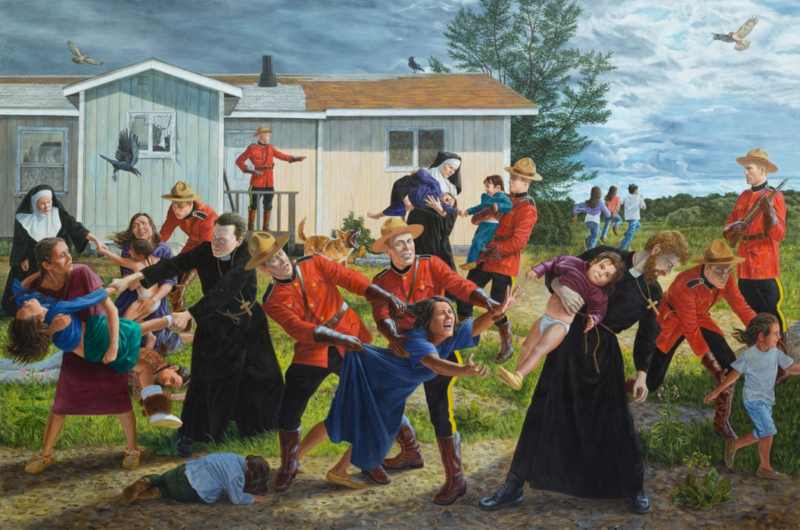 Of this painting, Monkman writes, “I seek to do justice to the unimaginable pain of losing children with a sense of sincerity and defiant bluntness.” I know this man, and I know this child, who is very much alive in real life. Carson, Archer’s child, as the ‘dying virgin’, stands in stark contrast to the vibrant, funny teenager who breathes today. This is when it strikes me: Monkman is painting history as if it is now. These living figures embody the memories of what has passed, and he has erected a monument to that which is alive. In so doing, he brings history into the present. The centrepiece of this room is The Subjugation of Truth. In the foreground, we see the seated, shackled figures of Pîhtokahanapiwiyin (Poundmaker) and Mistahimaskwa (Big Bear). An RCMP officer stands guard while the face of Miss Chief as a painted Queen Victoria watches over the scene. 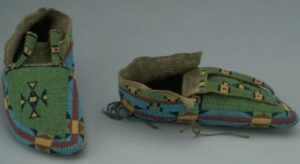 Standing beside the canvas, a woman rests her hand on a glass case that contains the actual moccasins of Pîhtokahanapiwiyin depicted in Subjugation. This woman is celebrated author Lee Maracle. “Do you know what you are looking at?”, I ask. “Yes,” she replies, shaking her head, “I can’t believe this is happening, that I am witnessing this, here, in my lifetime.” It seems to me that Lee is in tears, though gradually she begins to laugh. Eventually her laughter becomes the room’s centerpiece. The gravity of this exhibit fully takes hold. While standing by a framed copy of Treaty 7, another familiar face appears in a new wave of people entering the first chapters in the back rooms: Aaron, a dear friend and one-time colleague. He greets Lee Maracle exuberantly, and then gradually recedes into a rare quiet corner. Aaron wrote to me later of having to excuse himself as he began to cry near the picture of Pîhtokahanapiwiyin and Mistahimaskwa. As I move back into the current of exhibition, pressing my body against strangers, I look for moments of solitude with the work. A curious man appears before me each time I move in to examine a piece. Chewing a sandwich with aggravating vigour, he makes me laugh. I hunch behind the legs of strangers to look for explanations of what I’m seeing in glass cases: archival pieces from Canadian museum vaults, china platters of Benjamin West’s The Death of General Wolfe, shackles, a rifle, moccasins, beaded purses, and a doll’s papoose made by children at residential school as gifts to their new father, their principal. Standing among walls of cradleboards—eight exquisitely decorated wood and hide baby carriers by Shahaptin, Plains Ojibwa, and Iroquois artists from the mid 1800s to early 1900s, 24 gray and empty frames, and 11 mere chalk outlines—Sarah Hunt, my Kwagiulth friend and UBC Assistant Professor, comments on how the vibrant red surges of the Mounties radiate from the canvas, as if to bleed into the present moment. I then see the faces of several of my friends painted in by Monkman as mothers, children and a priest. As artists and parents who embody today’s spirit of strength and revolution, their faces remind me of the closeness of this history recaptured, that prejudice and shame are not gone, but, more importantly, that we are not gone. As Monkman writes in the foreword of the exhibition booklet, “My mission is to authorize Indigenous experience in the canon of art history that has heretofore erased us from view.” By weaving the viewer through many rooms, many chapters, this exhibit serves as a reminder of what the past 300 years have witnessed, and what it looks like to steadfastly resist. Shame and Prejudice: A Story of Resilience is on display at the Art Museum at the University of Toronto until Sunday, March 5, 2017. It will then move on to the Glenbow Museum in Calgary for June. In 2018, the exhibit will visit Kingston, Halifax, and the birthplace of Confederation, Charlottetown, with further plans to move across Turtle Island and internationally in the years ahead.